Mirvac Group has announced it has entered into an agreement with an investment vehicle sponsored by Morgan Stanley Real Estate Investing (MSREI), for the sale of a 50 per cent interest in its office development at 664 Collins Street in Melbourne. -Mirvac will provide development management and ongoing property and investment management services for the asset. Mirvac’s CEO and Managing Director, Susan Lloyd-Hurwitz, commented, “We are delighted to partner with MSREI at 664 Collins Street in Melbourne, which represents a key piece of the redevelopment over Southern Cross Station, and follows our successful 669 Bourke Street office development nearby. Once completed, 664 Collins Street will provide 26,000 square metres of office space across nine levels, with expansive floor plates of over 3,100 square metres. Designed by Grimshaw Architects, the A-grade building is 62 per cent pre-leased. Pitcher Partners has pre-committed to over 9,000 square metres and ExxonMobil has pre-committed to 7,100 square metres, with the remaining space currently under heads of agreement. 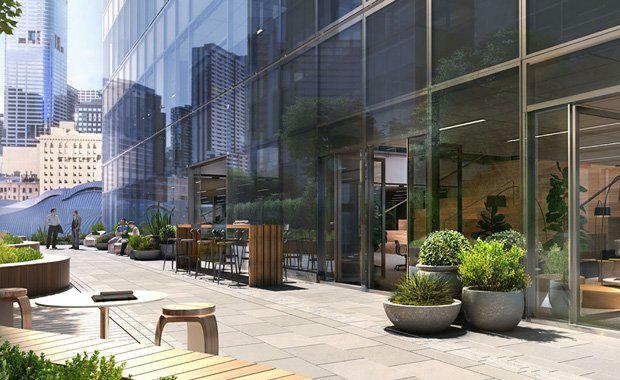 As part of the transaction, Mirvac will provide a five-year rental guarantee on any unlet office or retail space from the date of practical completion. In its unique urban location above Southern Cross Station, 664 Collins Street will provide its tenants with uninterrupted city views on all sides, as well as pedestrian access to the station, major tram routes, and both Collins and Bourke streets through a unique elevated open-air public walkway. Future tenants will also enjoy easy access to an abundance of adjacent amenity, such as childcare facilities, health clubs and more than a hundred fashion and food outlets. In line with Mirvac’s commitment to sustainable design, the building will be equipped with smart technology that collects real-time data to improve operational efficiency, as well as pioneering sustainability features. A 5 Star Green Star Design and 5 Star NABERS Energy rating are being targeted. The building also boasts best in class end-of-trip facilities exclusive to its tenants, along with on-site car parking. Practical completion is anticipated in FY18.